Edith R. Hayden was born circa 1910 at Washington, DC.1 She was the daughter of Julius A. Hayden and Emma Louise Mattson. KS Holcombe was the son of US Holcombe. Homer and Ella were enumerated in the 1930 Oneonta, Otsego Co., NY, federal census, ED 38. He was a laborer in a feed mill, age 44, she was 35. Children in the household were Claude 18, Cecil 17, Donald 14, Walter 9, and Byron 7. [S25] Hannah McPherson, Holcombe Genealogy, Page 61.2. [S182] Social Security Death Index (on-line), Ancestry.com, SSDI, Ancestry.com, SSAN 079-05-2061. Claude Holcombe was born on 20 September 1910 at Blenheim, NY.1 He was the son of Homer C. Holcombe and Ella May Loucks. Claude Holcombe died on 4 April 1999 at The Meadows, Oneonta, Otsego Co., NY, at age 88.1 He was buried on 9 April 1999 at Davenport Cemetery, Davenport, NY. ONEONTA -- Claude Holcomb, 88, of Oneonta, died Sunday morning, April 4, 1999, at The Meadows. Claude was born 20 Sep. 1910 in Blenheim, the son of Homer and Ella May (Loucks) Holcomb. Claude moved to the Oneonta area in 1917 and went to work for the New York State Department of Transportation. From 1935 to 1942, Claude lived in Gloversville. When Claude returned to the Oneonta area, he worked for the Otsego Laundry for 25 years and then became a route driver for Hoffmans Dry Cleaners. Claude was a member of the First United Presbyterian Church of Oneonta. Claude is survived by a special friend, Delphia Merwin of Colliersville; two brothers and sister-in-laws, Donald and Gerry Holcomb of Oneonta and Walter and Mary Holcomb of Blue Springs, Mo; a sister-in-law, Doris Holcomb of sidney; and nieces and nephews. He was predeceased by two brothers, Byron and Norman Holcomb. Graveside services will be held 11 a.m. Friday, April 9, 1999, and the Davenport Cemetery, Davenport, with the Rev. c. Spencer Van Gullick, pastor of the First United Presbyterian Church, Oneonta, officiating. Funeral arrangements are by the Bookhout Funeral Home, Oneonta and Otego. [S182] Social Security Death Index (on-line), Ancestry.com, SSDI, Ancestry.com, SSAN 123-18-7140. Donald Holcombe was born on 1 February 1916 at Gran Gorge, NY. He was the son of Homer C. Holcombe and Ella May Loucks. Donald Holcombe married Geraldine Walters, daughter of Earl Walters and Elizabeth Clark, on 10 October 1942 at St. Mary's Church, Oneonta, Otsego Co., NY. Donald Holcombe died on 5 December 2002 at Oneonta, Otsego Co., NY, at age 86. He was buried on 7 December 2002 at Mt. Calvary Cemetery, Emmons, Otsego Co., NY. ONEONTA — Donald A. Holcomb, 86, of Oneonta passed away Thursday, Dec. 5, 2002, at the A.O. Fox Memorial Hospital. He was born on Feb. 1, 1916, in Grand Gorge, the son of Homer and Ella (Loucks) Holcomb. He married Geraldine Walters on Oct. 10, 1942, in St. Mary's Church in Oneonta. A life long area resident, he worked for Oneonta Sales as a parts and service manager, a position that he held for over 50 years. He was also a former life member of the Oneonta Elks Club. Don was an avid gardener, but most of all was a loving and caring husband, father and grandfather and will be deeply missed by all that knew him. He is survived by his loving wife of 60 years, Geraldine Holcomb, of Oneonta; his two daughters and their spouses, Mrs. Donna (Holcomb) Beers and her husband, John of Andes and Mrs. Judy Sobers of Oneonta; four grandchildren, Grace Healey of Delhi, Richard Sobers Jr. of Phoenix, Ariz., Donald Beers of Oneonta and Geri Lynn Sobers of Oneonta; two great-grandchildren, Bryant Beers and Mercedes Sawyer. Four brothers, Claude, Norman, Walter and Byron also predeceased him. Funeral services will be held at 3 p.m. on Saturday, Dec. 7, 2002, in the Bookhout Funeral Home, 357 Main St., Oneonta, with the Rev. Judy Thistle, A.O. Fox Memorial Hospital chaplain, officiating. Friends may call at the Bookhout Funeral Home from 1 until 3 p.m. at which time the family will be in attendance. Arrangements are by the Bookhout Funeral Home of Oneonta. ONEONTA — Geraldine A. Holcomb, 82, of Oneonta passed away Wednesday, Oct. 27, 2004, at A.O. Fox Memorial Hospital with her family by her side. She was born Nov. 24, 1921, in Oneonta, the daughter of Earl and Elizabeth (Clark) Walters. She married Donald Holcomb on Oct. 10, 1942, in St. Mary’s Church in Oneonta. Mr. Holcomb died Dec. 5, 2002. Geraldine and Donald had just celebrated their 60th anniversary before he passed away. Gerry loved to bake and cook, having shared many meals and family gatherings in her home. Gerry and Don were always the cornerstone of the family, and it was their strong sense of family that kept everyone together. She is survived by her two daughters, Donna Beers and her husband, John, of Andes, and Judy Sobers and Arlene Nygren of Oneonta; her sisters, Jane Conklin of Oneonta, Irene Giotto of New Hartford, and Nancy Holling and her husband, Don, of Horseheads; and her sisters-in-law, Mary Holcomb of Missouri and Doris Holcomb of Sidney. She is also survived by her grandchildren, Grace Healey and her fiance, Robert Howard, of Delhi, Rick Sobers Jr. and his wife, Dee Decker, of Mesa, Ariz., Donnie Beers and his wife, Devon, of Oneonta, and Geri Lynn Sobers and her partner, Jamie Delamater, of Oneonta; her two great-grandchildren, Bryant Beers and Mercedes Sawyer; as well as many nieces, nephews and cousins. Funeral services will be held at 2 p.m. Friday, Oct. 29, 2004, in the Bookhout Funeral Home, 357 Main St., Oneonta, with the Rev. Judith Thistle, A.O. Fox Memorial Hospital chaplain, officiating. Burial will follow at a later date in Mt. Calvary Cemetery, Emmons. Friends may call from 1 to 2 p.m. Friday, at the Bookhout Funeral Home in Oneonta, at which time the family will be in attendance. Geraldine Walters was also known as Gerry Walters. She was born on 24 November 1921 at Oneonta, Otsego Co., NY. She was the daughter of Earl Walters and Elizabeth Clark. Geraldine Walters married Donald Holcombe, son of Homer C. Holcombe and Ella May Loucks, on 10 October 1942 at St. Mary's Church, Oneonta, Otsego Co., NY. Geraldine Walters died on 27 October 2004 at A.O. Fox Memorial Hospital, Oneonta, Otsego Co., NY, at age 82. She was buried on 13 November 2004 at Mt. Calvary Cemetery, Emmons, Otsego Co., NY. Donna Holcombe was born on 18 June 1945 at Oneonta, Otsego Co., NY. She was the daughter of Donald Holcombe and Geraldine Walters. Donna Holcombe married John Beers on 29 November 1964 at St. Mary's Roman Catholic Church, Oneonta, Otsego Co., NY. Donna Holcombe died on 31 October 2014 at A.O. Fox Memorial Hospital, Oneonta, Otsego Co., NY, at age 69. ONEONTA - Donna Ann Beers, 69, of Oneonta, passed away peacefully on Friday, Oct. 31, 2014, at A.O. Fox Memorial Hospital. Donna was born on June 18, 1945, in Oneonta, a daughter of the late Donald and Geraldine (Walters) Holcomb. She attended and graduated from Oneonta City Schools. On Nov. 29, 1964, Donna married John W. Beers at St. Mary's Roman Catholic Church in Oneonta. Donna and John would have celebrated their 50th wedding anniversary later this month. Shortly after their wedding, they moved to Andes, where John's family was from, and lived there for close to 40 years. Sometime after Donna's parents passed away in 2004, they came back to Oneonta and Donna was so happy to be back because she was moving into her childhood home. She loved being around John and doing things together; she had very special memories of their trips to Seneca and the Finger Lakes. She had one of the kindest hearts you could ever imagine. She never forgot a birthday and loved her time spent with her family, especially "family night." Family night consisted of a home cooked meal and card games like canasta with her children, and eventually grew to include grandchildren. One of her favorite family night activities was playing Parcheesi with her grandsons. Donna was definitely a people person. She would go out of her way to say a kind word to strangers she met on the street or sitting out on her front porch with her husband and would always have a friendly greeting for anyone passing by. Donna is survived by her beloved husband, John Beers of Oneonta; her daughter, Grace Healey and her companion, Ed Murray of Hewitt, N.J; her son, Donald Beers and his wife, Julie of Oneonta; her five grandchildren, Bryant Beers, Xavier Beers, Mercedes Sawyer, Anthony Gallucci and Nicholas Gallucci; her sister, Judith Sobers and her partner, Arlene Nygren of Goodyear Lake and many nieces, nephews and cousins. She was predeceased by her son, Tracy Lee Beers. Family and friends are invited to visit between 11 a.m. to 1 p.m. Wednesday, Nov. 5, 2014, at the Bookhout Funeral Home, 357 Main St., Oneonta, at which time her family will receive guests. A memorial service will follow the calling hours at 1 p.m. at the funeral home, with the Rev. Judith A. Thistle, Director of Chaplains at the A.O. Fox Memorial Hospital, officiating. In lieu of flowers, Donna's family asks that you kindly consider making a donation in her memory to the National Kidney Foundation, Finance Department, 30 East 33rd St., New York, NY 10016. John Beers was born on 6 May 1937 at Grand Gorge, Roxbury, Delaware Co., NY. He married Donna Holcombe, daughter of Donald Holcombe and Geraldine Walters, on 29 November 1964 at St. Mary's Roman Catholic Church, Oneonta, Otsego Co., NY. John Beers died on 25 February 2017 at Chestnut Park Rehabilitation & Nursing Center, Oneonta, Otsego Co., NY, at age 79. He was buried at Mt. Calvary Cemetery, Emmons, Otsego Co., NY. John W. Beers, 79, of Oneonta passed away Saturday, February 25, 2017 at Chestnut Park Rehab. & Nursing Center. He was born May 6, 1937 in Grand Gorge the son of the late Cornelius B. Beers, Sr. and Rose (Hilliker) Beers. John proudly served his country in the US Army. For many years John worked at the creamery and then began driving truck. On November 29, 1964, John married Donna Ann Holcomb at St. Mary's Roman Catholic Church, Oneonta. Donna predeceased him on October 31, 2014. Shortly after their wedding, John and Donna moved to Andes where his family was from and lived there for 40 years before moving back to Oneonta in 2004. John enjoyed trips with Donna to Seneca Lake and the Finger Lakes. He especially enjoyed seeing the old farms. He was a prankster and was always playing jokes on his family. He could never sit still so you would always find him up doing something to keep himself busy. But what brought John the most joy was his grandchildren. He would do anything they needed or asked of him. John is survived by his children, Grace Healey and Ed Murray, Hewitt, NJ and Donald and Julie Beers, Oneonta; 5 grandchildren, Bryant Beers, Xavier Beers, Mercedes Sawyer, Anthony Gallucci and Nicholas Gallucci; siblings, David (Marcia) Beers, Arizona, George Beers, Florida, Judy (Henry) Jobmann, Andes, JoAnn (Len) Vetsch, Arizona, Joyce Crisell and Bill Wicks, Sidney, April Vance, North Carolina, Mary Smith, Tennessee and Fawn (Earl) Spangler, North Carolina; sisters-in-law, Mary Jane Beers, Franklin and Judith Sobers and partner, Arlene Nygren; as well as many nieces, nephews and cousins. He was predeceased by his son, Tracy Lee Beers and brother, Cornelius B. "Cappy" Beers, Jr. Calling hours will be held on Friday, March 3, 2017 in the Bookhout Funeral Home, 357 Main Street, Oneonta from 11:00 am to 1:00 pm. Memorial services will immediately follow at 1:00 pm with the Rev. Judith A. Thistle officiating. Burial will be held in the spring in Mt. Calvary Cemetery. For those who wish, memorial contributions may be made to the Alzheimer's Association, 225 N. Michigan Ave., Fl. 17, Chicago, IL 60601-7633. To light a candle or send an online condolence please visit www.bookhoutfuneralhome.com Funeral arrangements are by the Bookhout Funeral Home of Oneonta. - See more at: http://obituaries.thedailystar.com/story/john-beers-1937-2017-881741802#sthash.Wxln7MR4.dpuf. Ida Hightower was born on 3 November 1887. She was the daughter of Harry Homer Hightower and Julia Augusta Hayden. Ida Hightower married Frank Lamar Fleming circa 1917. Ida Hightower died on 13 June 1975 at age 87. She was buried at Oakland Cemetery, Atlanta, GA; Block 8, Lot 305. Frank L. and Ida H were enumerated in the 1930 Buckhead, Fulton Co., GA, federal census, ED 147; 2692 Peachtree Road. He was a wholesale druggist age 54, she was 42, they had been married 12 years. Children in the household were Frank L. Jr. 10, Harry H. 7, and Ida H. 3. Also in the household was sister-in-law Nellie Hightower. Frank Lamar Fleming was born on 20 December 1875 at GA; GS.1 He married Ida Hightower, daughter of Harry Homer Hightower and Julia Augusta Hayden, circa 1917. 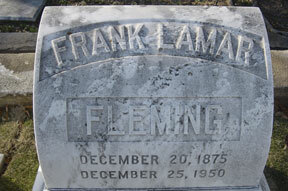 Frank Lamar Fleming died on 25 December 1950 at age 75; GS. He was buried at Oakland Cemetery, Atlanta, GA; Block 8, Lot 305. 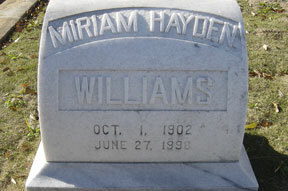 Miriam Hayden Williams was born on 1 October 1902; GS.1 She was the daughter of John Griffith Williams and Nellie Hayden. Miriam Hayden Williams died on 27 June 1996 at Evanston, Cook Co., IL, at age 93; GS.1 She was buried at Oakland Cemetery, Atlanta, GA; Block 8, Lot 305. [S182] Social Security Death Index (on-line), Ancestry.com, SSDI, Ancestry.com, SSAN 337-38-6799. Nellie Hayden Hightower was born on 28 May 1885.1 She was the daughter of Harry Homer Hightower and Julia Augusta Hayden. Nellie Hayden Hightower died on 5 January 1975 at Atlanta, Fulton Co., GA, at age 89.1 She was buried at Oakland Cemetery, Atlanta, GA; Block 8, Lot 305. Nellie was enumerated in the 1930 Buckhead, Fulton Co., GA, federal census in the household of brother-in-law Frank Fleming; she was 45. [S182] Social Security Death Index (on-line), Ancestry.com, SSDI, Ancestry.com, SSAN 252-72-1972. Harry Hightower Fleming was born on 22 September 1922. He was the son of Frank Lamar Fleming and Ida Hightower. Harry Hightower Fleming died on 11 December 1937 at age 15. He was buried at Oakland Cemetery, Atlanta, GA; Block 8, Lot 305. Harry died when struck by a car while riding his bike. CPT Orville Clark Holcombe was born on 17 September 1832 at Portage Co., OH. He was the son of OH Holcombe. CPT Orville Clark Holcombe was buried at Rio Alto Cemetery, Saguache Co., CO.
Orville was a Captain in the 137th Invantry, Illinois Volunteers, Company G; he enlisted 5 Jun 1864 and was mustered out 24 Sep 1864. The One Hundred and Thirty-seventh Infantry Illinois Volunteers was organized at Camp Wood, Quincy, Ill., by Colonel John Wood, and was mustered in June 5, 1864, for one hundred days. On June 9, 1864, the Regiment left Quincy, and proceeded to Memphis, Tenn., where it was assigned to Fourth Brigade, District of Memphis, Colonel E. L. Baltwick, Thirty-ninth Wisconsin, commanding. On July 9, assigned to Third Brigade, Colonel John Wood commanding, and was stationed on the Hernando road, on picket duty. The Regiment was mustered out of the United States service at Springfield, Ill., September 4, 1864. There was an "O. Holcomb" enumerated in the 1880 Grassyhill, San Juan Co., CO. He was listed in a hotel run by W. D. Watson, a toll Collector, age 38, born in OH, parents born in CT and NY. An Orville C. Holcombe married a Sarah E. Kinmon on 2 Nov 1853 in Pike, IL (IGI). They had children George A. born about 1856, and John H. about 1858. [S489] Steven Watrous, "John Watson Watrous." DeWitt and Addie were enumerated in the 1880 Colesville, Broome Co., NY, federal census. He was a farmer age 39, she was 39. Children in the household were Earl 9, and Jessie 3. DeWitt and Adelia were enumerated in the 1920 Colesville, Broome Co., NY, federal census, ED 68. He was a retired farmer age 79, she was 80. Son Earl was living next door. DeWitt was enumerated in the 1930 Colesville, Broome Co., NY, federal census, ED 56. He was 89, in the household of son Earl V. Watrous. 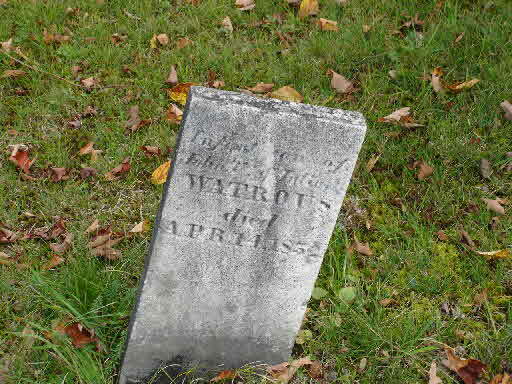 Rosella Watrous was born in 1853 at Colesville, Broome Co., NY.1 She was the daughter of John Watson Watrous and Julia Marilla Holcombe.1 Rosella Watrous married John Harvey Hayes before 1875.1 Rosella Watrous died in 1933.1 She was buried at Tunnel, Broome Co., NY. Frank Fleming was born circa 1919 at GA.1 He was the son of Frank Lamar Fleming and Ida Hightower. Frank Fleming died at Cashiers, NC. Frank and Jean had three daughters. Hayden Fleming was born on 5 January 1927.1 She was the daughter of Frank Lamar Fleming and Ida Hightower. Hayden Fleming died on 3 April 2002 at Atlanta, Fulton Co., GA, at age 75.1 She was buried on 6 April 2002 at Oakland Cemetery, Atlanta, GA; Block 8, Lot 305. 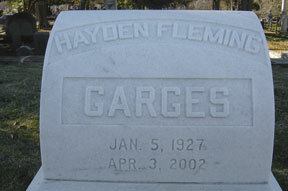 Hayden Fleming Garges, 75, a native of Atlanta, passed away April 3, 2002. She was a member of First Presbyterian Church of Atlanta, the Peachtree Garden Club, and the Junior League of Atlanta. She attended E. Rivers Elementary School, Washington Seminary and Mt. Vernon College. Surviving is her husband of 55 years, Robert L. Garges; 4 daughters and sons-in-law, Eleanor and Doug Maxwell, Hayden Yow, Leslie and Bryan Bachler and Elizabeth and John Izard, Jr., and 6 grandchildren. Funeral services will be 11:00 AM Saturday, April 6, at First Presbyterian Church of Atlanta, (1328 Peachtree Street N.E. Atlanta, GA, 30309). Dr. George B. Wirth officiating. The family will receive friends one hour prior to the service at the church. Private interment will be in Historic Oakland Cemetery. In lieu of flowers, the family requests donations to Hospice Atlanta, 133 Luckie St. Atlanta, GA, 30303 or charity of your choice. Arrangements made by H.M. Patterson & Son Spring Hill, 404-876-1022. [S182] Social Security Death Index (on-line), Ancestry.com, SSDI, Ancestry.com, SSAN 256-38-9906. Richard H. Whitner was born in 1861; GS. He married Mary Hayden, daughter of Judge Julius A. Hayden and Harriet E. Cone, on 20 November 1888 at Sanford, Orange Co., FL. Richard H. Whitner died in 1911; GS. He was buried at Lakeview Cemetery, Sanford, Orange Co., FL. The Whitner family was very prominent here in Sanford and one of our earliest pioneer families. The Whitner's lived a few houses down from the Hayden's, (in 1880). The Hightower family was next door to the Hayden's. 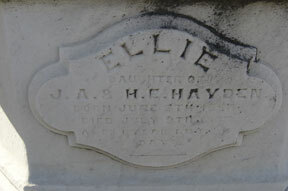 Ellie Missouri Hayden was born on 5 June 1854. She was the daughter of Judge Julius A. Hayden and Harriet E. Cone. Ellie Missouri Hayden died on 9 July 1855 at age 1. She was buried at Oakland Cemetery, Atlanta, GA; Block 8, Lot 305. Mary Gertrude Hayden was born on 20 November 1859; GS. She was the daughter of Judge Julius A. Hayden and Harriet E. Cone. 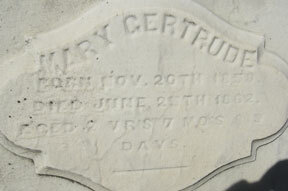 Mary Gertrude Hayden died on 25 June 1862 at age 2; GS. She was buried at Oakland Cemetery, Atlanta, GA; Block 8, Lot 305. [S528] Ann Smith Lainhart and Robert S. Wakefield, MF 22, page 2.